I see this guy in Downtown Crossing all the time, and I finally had the opportunity to take his photo. Obviously, MENSSUITS is the funniest part of this sign, but I just noticed that the sign also spells warehouse wrong. If that were intentional, it would actually be a pretty good pun. But alas, I think it's just a spelling mistake. Update: An alert reader pointed out that Men's Wearhouse is actually the correct spelling of the store's name. Surprisingly clever! However, there should be an apostrophe in Men's, so that part is still wrong. Actually, menssuitsnewyork is an actual website, and Men's Wearhouse is a rival store. However disturbing, there is nothing actually wrong with this sandwich board. 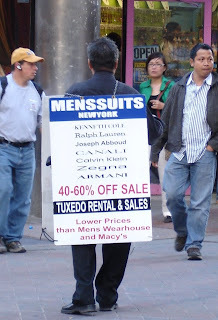 Well, if it's a web site, it should say menssuitsnewyork.com. Otherwise, it's unclear. Wow, you are right about the Men's Wearhouse. That is actually clever! I've heard their commercials on the radio, but I guess I never thought about how the name was spelled. Haha... I see this dude EVERY DAY on my way to meetings. I always cross the street to avoid him and his flyers. The reader's what doesn't work?